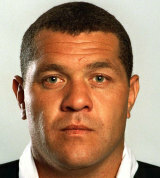 Little was a formidable inside centre for the All Blacks during the 1990s. He made his debut for the All Blacks in 1990 and racked up 50 caps and 44 points during his eight-year stint in the New Zealand midfield. He was perhaps best known as part of a fearsome midfield pairing with outside centre Frank Bunce. After being on the periphery of the All Blacks squad during the 1991 World Cup, Little was a central figure alongside Bunce during the 1995 tournament and also helped New Zealand to an unbeaten season in 1996. A serious knee injury hastened his decline and he played his last test against the Wallabies in 1998. At club level he finished with what was a record-equalling 145 appearances for North Harbour and 43 matches in the Super 12.